I redid the design I gave to my sister & have donated the design to the 2017 Chapter Project Book. You can see it at Seminar in the Distance Learning Program area. It is intended to teach how to manipulate an overdyed thread. This uses the same overdyed thread, Watercolours Lilac (039) as I had used for my sister. What do you think? 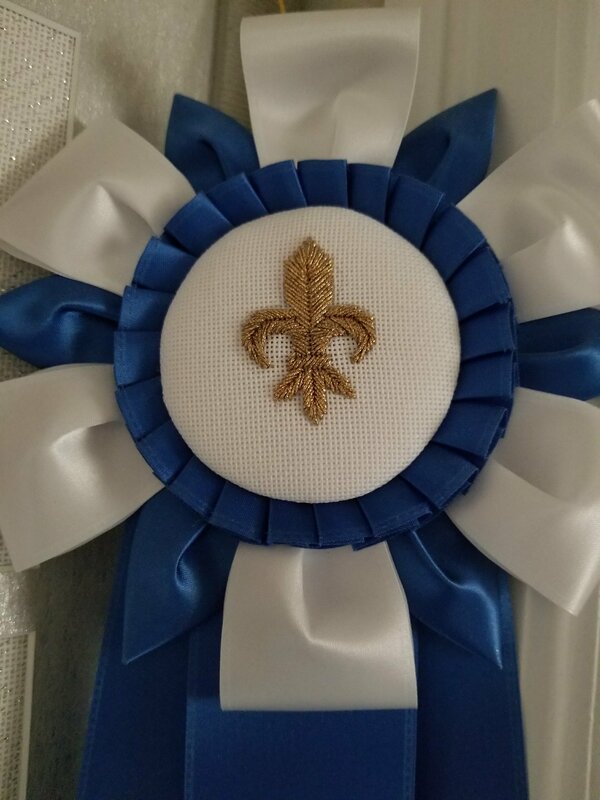 Are these French Knots?? Don’t worry, I won’t post all my diagrams!!! Kudos to Cynthia Thomas for teaching 14 people how to create diagrams using Excel in just a few hours! I’m so happy it’s easy to learn. But, it will be time consuming to create my own “library” of stitches. Good thing I am retired now!! 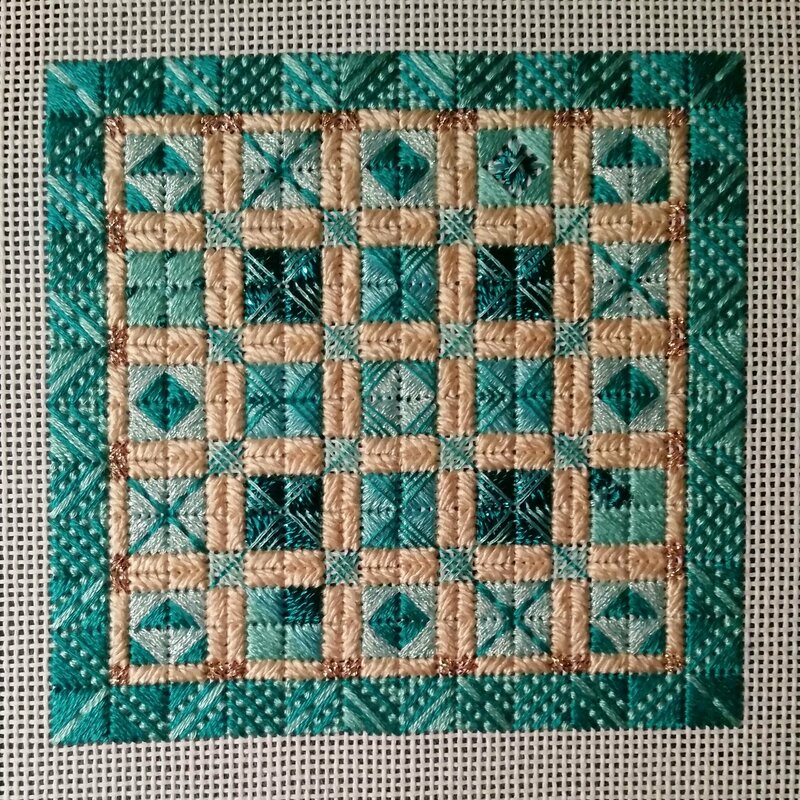 In researching Scotch Stitches, I learned that Box Stitches are described as a “series of diagonal stitches that form squares or boxes” from Jo Ippolito Christensen in The Needlepoint Book. 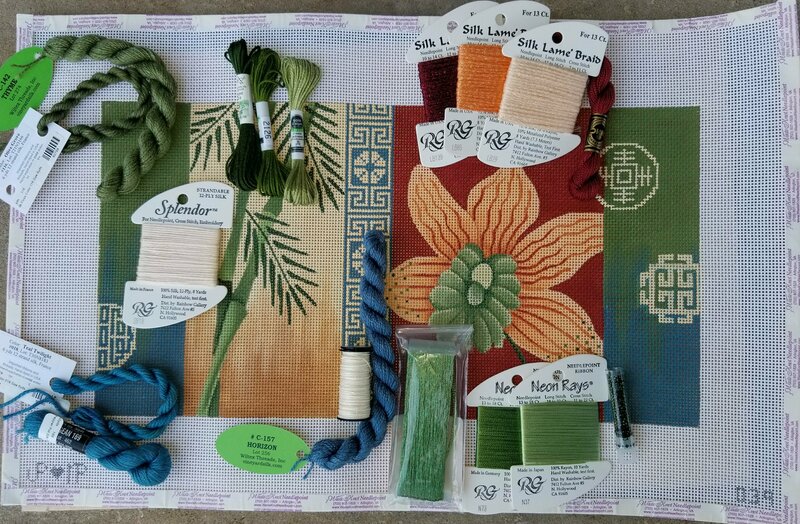 The Mosaic Stitch is the smallest of the Box Stitches, Cashmere is a rectangular Mosaic Stitch, and Scotch Stitch is an expanded Mosaic Stitch. 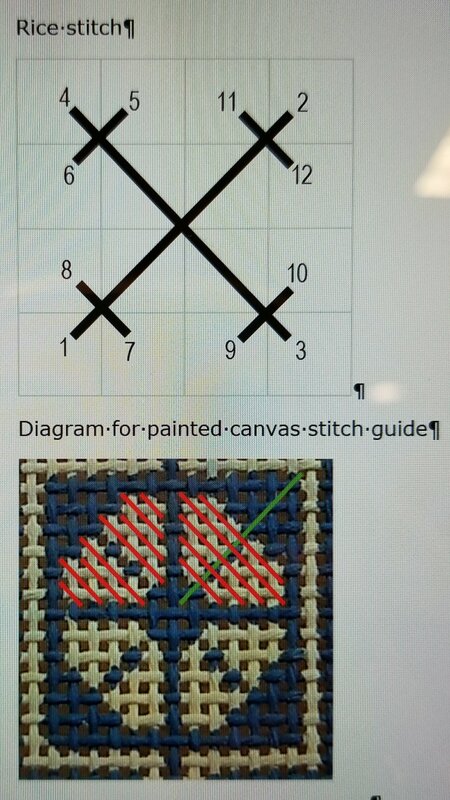 I found Scotch Stitch variations in The Needlepoint Book, Amy Bunger’s Keeping Me In Stitches, and SuZy’s Portable Stitches app. However, I found the Scotch Stitch variations in Scotch Stitch by Stitch by Kathleen Rake the most inspirational and educational by learning how to vary stitches with size, direction, color, and threads to create endless variations. After having just stitched Designing with Stitches by Julie Goetsch (http://needlepoint.org/Archives/00-01/Design.php – originally published in NeedlePointers, Volume X, Number 1, Spring 1982) with my ANG chapter, I stitched the frame using the Cashmere and Mosaic Stitches instead of the Oblong Cross Stitches as Julie had done. The frame is comprised of numerous 4 by 2 units and 4 corners that are 2 by 2. This created the appropriate negative spaces: 25 areas that are 8 by 8 and 16 areas that are 4 by 4. There are 10 variations of the Scotch Stitch in the 25 larger negative spaces (8 by 8 areas; A-G), 3 variations in the smaller negative spaces (4 by 4 areas; a-c), and 6 variations (6 by 6 areas) repeating to form the outermost border. There’s lots more variations that could be cooked up using more Scotch variations, more threads, or both! ANG Seminar is just about to get underway. People are heading west to Anaheim this year. Weather looks to be sunny and warm. Bill will be golfing with Harvey, whose wife Rita is also attending. And, I’m ready to pack our suitcases. Lots to bring! I have to take my computer for Monday’s class with Cynthia Thomas. We’re going to learn how to make charts/diagrams using Microsoft Excel. Looking forward to that. I do some designing but have not invested in a program. I have relied on others for getting my hand drawn diagrams into something presentable. Hopefully, this will be sufficient for my needs. In fact, the whole week I will be with Cynthia! For the following 4 days, I will work on 2 canvases in her Painted Canvas Embellishment Class. I sent her photos of 2 related canvases and she returned a suggested thread list (general enough to allow flexibility based on availability). Linda and I spent a great afternoon at Rittenhouse Needlepoint picking out threads. The canvases (13 count) are ones I bought on previous road trips. 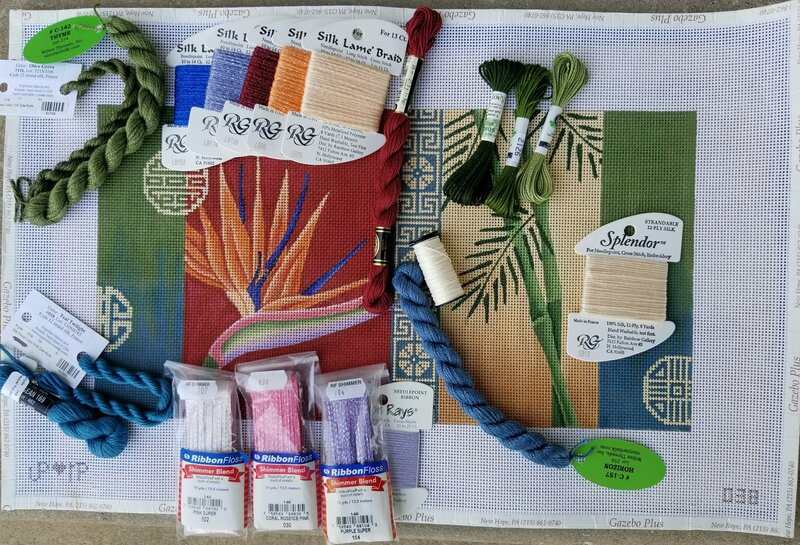 One is JP Bird of Paradise & Bamboo and the corresponding JP Orange Orchid & Bamboo; each are pictured with the threads I selected. 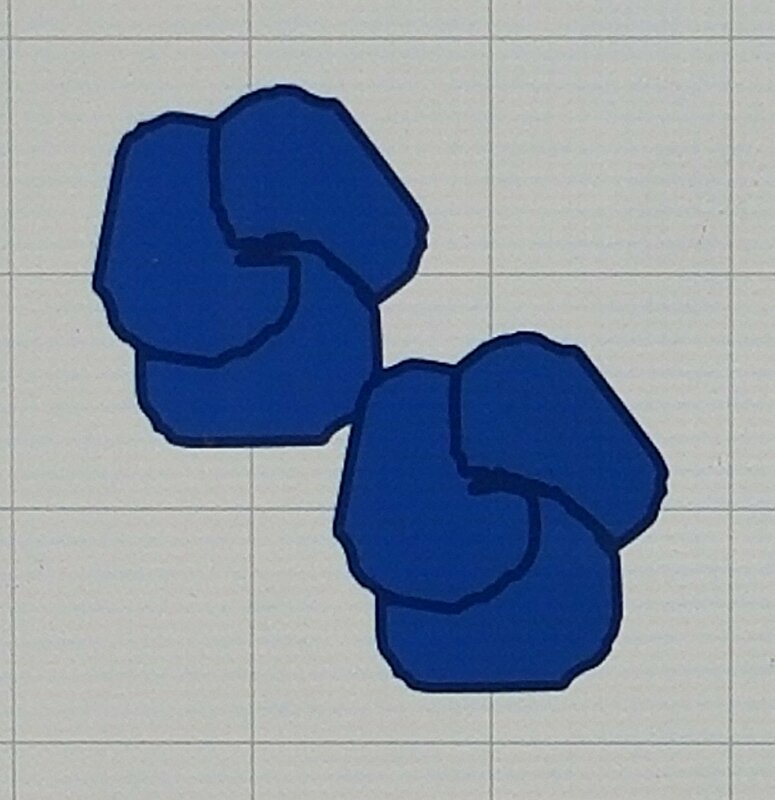 Can’t wait to see what Cynthia has in mind for these and start stitching. No doubt certain sections will repeat in both canvases which is why she graciously agreed to these as my project. I believe that I’ll be focusing on the flowers during class. I will be finishing these as pillows.